The Dour is a chalk stream. The water is very pure because rainwater is filtered by the chalk hills as it passed through to lower rock strata. The water emerges as a spring at Watersend near the village of Temple Ewell. In very wet weather a secondary tributary rising in the Alkham valley - the Nailbourne - may also flow into Bushy Rough. Chalk streams are a nationally rare environment. They are very important for species such as brown trout which need clean gravel beds in which to lay their eggs. If the eggs were to be covered in silt they would suffocate. Ornamental Ponds at Bushy Rough - home to swans and ducks. 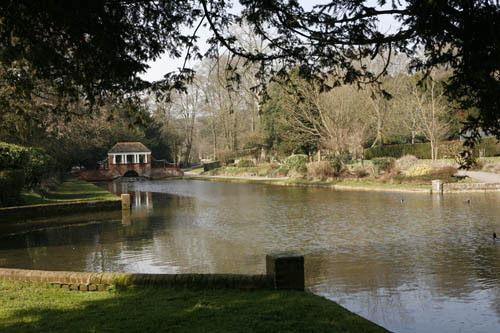 Although some parts of the river run through culverts (tunnels), the greater part of the Dour runs through public land and gardens. Near the source the river flows into lakes and ornimental ponds, providing deep water habitats where swans breed and larger fish can develop. Downstream the river becomes faster flowing and shallower - a great enviroment for bottom-feeding fish such as miller's thumb and stone loach. Brown trout and eels are found along most of the river. Swans mainly congregate on the upstream lakes, but mallard ducks, coots and moorhens can be seen all the way downstream until the culverts near the sea. Herons and little egrets take advantage of good fishing, and sharp-eyed visitors may spot kingfishers hunting.